We’ve proposed a branch upstream to add support for synaptics as well as libinput to Mutter. We’ve updated Mutter and GNOME Shell in Bionic. Due to some holidays upstream we missed Feature Freeze, and so got an exception to land this one. We’ve got a PR upstream for helping to protect against broken third party extensions which could prevent a user logging in to their session. We’ve agreed with the Community Theme team that we won’t ship it by default in 18.04, but that we will make it easily installable for people who want to test it, and will move over to it in the 18.10 cycle. 16.04.4 LTS point release was released, rolling up a number of updates, security fixes and a new kernel and graphics stacks. Softpedia covered the point releases here. The Ubuntu GeoIP service (used, for example, by the installer to guess where you are in the world) now supports HTTPS, and so we’ve ported some services over to use it. Packages have been updated to allow Telepathy to be dropped from main. The changes for the minimal desktop install have landed in the installer. Support for themes in snap applications is moving ahead and you can read more about the current state here. Promoted 6.0.1 snap to the stable channel. 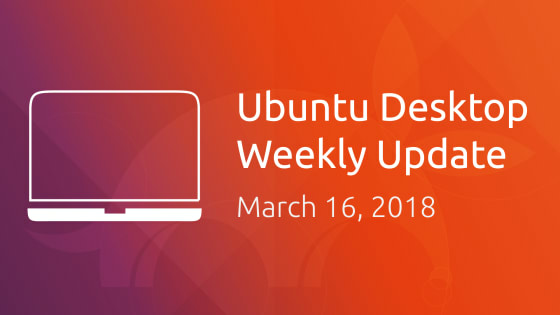 The Ubuntu Podcast has an interview with Will Cooke in this week’s episode, talking about 18.04 LTS.